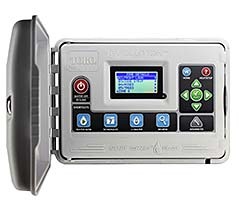 The Evolution® performs like a traditional time-based controller with the ability to work as a smart controller. The user interface includes shortcut buttons for quick access to basic functions. An optional Smart Connect™ device enables the controller to wirelessly communicate directly with add-on-devices, such as a weather sensor, a handheld remote, multiple soil sensors, and two wireless relays.